Argotti Gardens, Floriana. Photo: Matthew Mirabelli. Right: The Argotti’s superb main fountain. Argotti Botanical Gardens, endearingly known as il-Gotti, is the legacy of Fra Martino de Sarria Navarro, Don Emanuel Pinto de Fonseca and Bailiff Ignatius de Argote de Guzman. The Knights of the Hospitaller and Military Order of St John first attempted to set up a medical garden in the fortress of St Elmo in Valletta as far back as 1647. Giuseppe Zammit, a priest physician and chaplain of the Order and a teacher of medical sciences, forked out money to nurse a botanical garden. He grew medicinal plants in stone containers with which he hoped to further the knowledge of his students. When in 1676, Grand Master Nicholas Cottoner funded the lectureship of anatomy and surgery in the Order’s infirmary (now the Mediterranean Conference Centre) the first appointment was that of Zammit. In 1800, the garden was transferred to Floriana, partly to the Sarria Garden and partly to the Mall Garden. Malta’s British rulers developed the idea of a botanical garden. In 1805, Alexander Ball, the first British commissioner in Malta, appointed a Carmelite monk, Carolus Hyacinthus, as professor of natural history, and the garden fell under the University of Malta’s jurisdiction. He chose the Maglio as the University’s new botanical garden. However, in 1855, S. Zerafa amalgamated and transferred the botanical gardens of the Maglio to the garden of Villa Sarria and then moved both to the Argotti Garden. The origin of Villa Sarria dates back to 1585 when Hugues Loubenx de Verdalle was Grand Master (1582-1595). The limits of the villa encompassed all the space now bordered by St Publius Street, St Thomas Street and Fosse Street, now called E.S. Tonna Square. No building cluttered the es­planade except for the extensive Villa Sarria. Eventually the villa was pulled down to make way for the building of Sarria church and Floriana primary school. A huge block of social housing opposite the Boy Scouts Headquarters was several storeys high. Incidentally, I was born in 1930 in one of these residences. Besides this construction, the building of residential homes extended to St Publius Street. These buildings practically eliminated Sarria Garden. The gardens of Villa Sarria used to be a treasure. It existed on the Floriana promontory before the birth of the city itself. Up to 1761 the Floriana fortifications were still in the process of being built. The garden area was an ideal place to relax. Garden fountains enhanced the beauty of Villa Sarria. It offered a restful pleasure for the many knights who temporarily lived in it for periods of time. Trouble brewed for a while when some knights wanted to make it their permanent residence. The villa and its garden required the construction of huge reservoirs. These all still exist except the one at the northern end of St Thomas Street. This reservoir was destroyed in a Luftwaffe attack on April 24, 1942. The rubble of the classrooms on top of it filled the crater. It was never reconstructed. The plan of the gardens was based on the Italian model. The entrance to the garden was in St Thomas Street where the main door to the primary school now stands. From the entrance, a straight passage was flanked by four identical sections on each side of the passage, with an impressive fountain in the middle. A high wall stood at the far end of the passage. An iron gate opened into another extended garden on which stood the villa. Probably its building covered the area where the Boy Scouts Headquarters and the Methodist church now stand. Thus, the larger garden occupied quite an extensive area but the plan of the smaller garden was a copy of the larger one. It had rectangular sections bisected by straight passages in a grid-iron pattern. It was a later imitation of the building blocks and straight streets of Floriana. Grand Master Jean Paul Lascaris (1636-1657) built St Philip’s Garden as a private garden on a ravelin below Argotti Gardens. This triangular fortification complemented St Francis Ravelin across St Anne Street. In 1941, Poulestorn Villa in St Philip’s Garden was annexed by Argotti Botanic Garden, but it was only in 1996 that the inner part of the garden, the section bordered by iron railings, was handed to the University. The superb main fountain in St Philip Gardens was originally located in St George’s Square, Valletta. It had been built by Pinto in 1751 and was the first fountain erected after the construction of the Wignacourt Tower opposite Sarria church next to the main entrance of the Argotti. The fountain was built to commemorate the completion of the aqueduct project. Water was channeled by gravity from Rabat to Valletta. The fountain features a large circular basin with three superimposed basins shaped like sea shells. Each one is smaller than the one below it. The fountain is supported on a cone-shaped pedestal of three dolphins with upturned tails. It was inaugurated during Eastertide, April 21, 1615. After its inauguration, great festivities were organised. They included firework displays, games and races. During the celebrations the Grand Master handed out sums of money to the populace. The British military authorities moved the fountain to St Philip’s Garden in Floriana as it was an obstruction to military functions in St George’s Square. The Lascaris fountain was an attractive embellishment of the main square. It was found under rubble in Ġnien is-Sultan, next to Victoria Gate and was rebuilt at the Argotti in 1956. Argotti Gardens, including its villa, were originally a private possession. From its ramparts, the gardens command fantastic views. Originally the garden and villa belonged to Bailiff Vergas. They were inherited by the Portuguese knight Don Emanuel Pinto de Fonseca. His garden was laid out on St James Bastion. It covered the northern part, with its entrance in St Calcedonius Street. He also built the Dolphin fountain and a small circular fountain. In 1741, Pinto became Grand Master of the Order. In 1741, Pinto’s garden was passed to Argote de Guzman, hence the name of Argotti. Argote’s garden covered an area opposite Sarria church. In fact, Argote had built his own entrance opposite the Maglio gates. Both Pinto and Argote had respectively shared the two entrances. The gardens must have been adjacent to each other. When Argote gained possession of the whole garden he built himself a villa. A section of this is still standing. The stables attached to the villa had been turned partly into a herbarium and partly into offices of the administrators. Argote also built a nymphaeum on the left side. Entrance was through a low iron gate in the private section of the garden. The central embellishment was an ornamental grotto covered by pieces of red coral, calcite crystals, seashells and coloured pebbles. 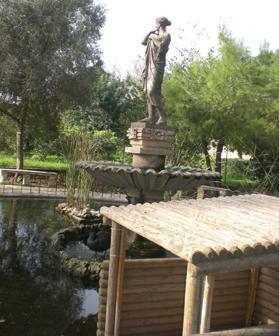 The statue of Venus from the Argotti’s nymphaeum now stands over a fountain at San Anton Gardens, Attard. The attraction focused on the fascinating statue of Venus or Diana carrying a bow in her hand. The structure stood on three dolphins, all resting on a water basin forming a fountain. The statue stood between two columns. The cavity structure was encased with pebbles, red coral, sea shells and calcite crystals. Unfortunately little is left of the mosaic floor. The two columns supporting an arch have suffered much deterioration. They were replaced by an identical new structure. Much to Floriana’s dismay, in 1984 the statue of Venus was taken away from the nymphaeum. Now it towers over a side fountain at the gardens of the President’s San Anton Palace. Its replacement at the botanical garden was a poor imitation of the work of art. After Argote’s death, the garden went through a period of neglect. However it was brought back to life with the planting of more exotic and indigenous plants and trees. Before Villa Sarria was demolished, the collection of plants there were transferred to Argotti Garden in 1855. The British rulers converted the private garden into a botanical garden under the tenure of the University of Malta. Since 1880, the professor holding the chair of natural history had a curator as his assistant. The section guarded by iron railings enclosed the botanical garden. It has gained an international reputation for its unique collections. Many eminent Maltese curators contributed to the enhancement of the Argotti. John Borg endowed the Argotti with his unique collection of cactuses that established its name worldwide. It boasted over 4,000 succulent plants. Several professors imported exotic plants to add to the collection of the botanical garden. Ironically it was only as late as 1890 that the collection was officially recognised as a botanical garden. In fact, Argotti Botanical Gardens are among the oldest in the Commonwealth, after that of Oxford (1632) and Edinburgh (1670). Pinto’s imposing entrance crowned by his coat-of-arms stands opposite the side entrance to the seminary in St Calcedonius Square. Argote built another entrance opposite the old gate to the Mall Garden which is more accessible to the public. Another artistic structure was the superb glasshouse. It ensured that the botanical collection was protected from the atmospheric elements. The design was possibly that of the draughtsman Andrea Vassallo (1856-1928). He was honoured with an architect’s warrant even though he had not attended a University course. 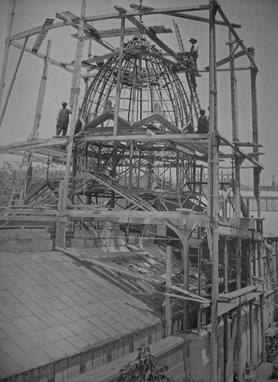 The magnificent and aesthetically pleasant wrought iron greenhouse of Argotti Gardens was unfortunately pulled down in 1931. Vassallo was an expert in wrought iron works. He planned and built the greenhouse, also referred to as the conservatory of Argotti Gardens, around the middle of the 19th century. It was an impressive, visual attraction, placed in front of the spacious fountain square. Its complex wrought iron works were magnificent. Aesthetically its pleasant design drew much admiration. Unfortunately the glasshouse was pulled down in 1931. The wrought iron needed constant maintenance and therefore much expense. The foundations buried in the earth corroded and the structure became dangerous. Besides, workers continually grumbled as it rusted quickly and demanded constant work and attention. The authorities took the easy way out. They dismantled it. Thus, Floriana lost a wrought iron jewel. It was of primary importance to retain rare botanical species. Above all, it was a monument of a capable engineer who was not even an architect. During the war, Argotti Gardens fell victim to the Luftwaffe’s bombing campaign. In his collection of essays, Final Focus on Floriana, Emmanuel Tonna explains how the bombardments played havoc on Floriana, turning the Argotti into a shambles. However, a few precautions were taken. In fact, the famous herbarium was taken down into an excavated room of a rock shelter, thus saving the treasure for posterity. My association with the Argotti goes back to my childhood years. The tunnel leading to the old railway station provided space for several Floriana primary school classrooms. Later on, a sheltered corner of the Argotti’s solitude and silence helped me concentrate on my studies during my final year at the lyceum. Carmelo Penza and M.A. Delia served in succession in the capacity of curators until the University was relieved of its hold over the Argotti Botanic Garden. The Ministry of Agriculture and Fisheries took over the botanical gardens in 1973. The public garden also came under the Agriculture Department’s control in 1973. Unfortunately, the garden was allowed to fall into neglect: it suffered the vicissitudes of incompetent management of government policies. The intervention and pleadings of C. Penza touched the conscience of the minister. A big effort was made and hard work done. The public section of the garden was officially inaugurated in December 1974 and opened to the public. Up to 1994 the Argotti remained a public garden under the supervision of the Public Works Department. Today Argotti Gardens has a dual personality: the public area contains rare trees, plants and flower beds. The many benches shaded by trees invite mainly Floriana residents to enjoy periods of relaxation. Sunday mornings serves as an invitation to others. They enjoy a pleasant walk through the ‘Biskuttin’ garden opposite the Phoenicia Hotel, through the Mall Garden and then a leisurely walk into the Argotti. Argotti Botanical Garden also forms part of Gardmed, a network of Mediterranean gardens whose aim is to promote competitiveness, innovation and research. Today the botanical garden has several roles. It maintains indigenous and exotic collections of plants adapted to Mediterranean climatic conditions as well as cactuses and succulents. It also collects and catalogues specimens for the herbarium and seeds for the seed bank. The garden is involved in conservation pro­jects and focuses on the propagation of rare species, including endemics. The garden is also a means of education with University students undertake research projects there. Joseph Buhagiar, the present curator, also organises tours for students, tourists and for public bodies. 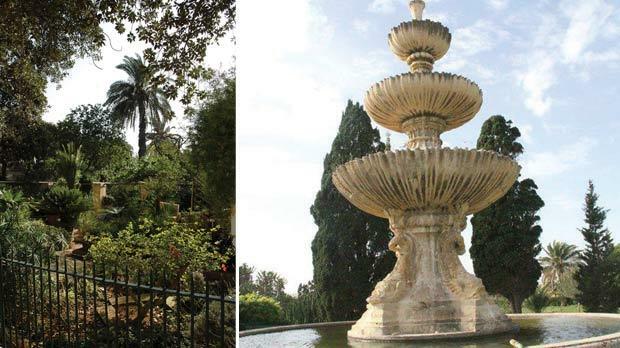 According to Buhagiar, Argotti Botanical Garden is now the realm of the University of Malta and used for educational purposes. The villa that Argote built in 1741 had been partly destroyed but the section that is still standing has been rehabilitated. The section that previously housed the stables is newly constructed to house the offices of the administration. A small horticultural museum contains artifacts consisting of route maps, plant pressing equipment and seed collection. They have been salvaged from the rigors of time and war. Another spacious room is reserved for talks and lectures for students attending the medical course at University. Naturalists, botanists and medical doctors doing research work consider the Argotti a treasure throve. The cellar is being cleaned to be set up as a visitors’ centre. Many extant stuffed animals are still being doctored to save them from being lost. Many now embellish the Natural History Museum in Mdina.